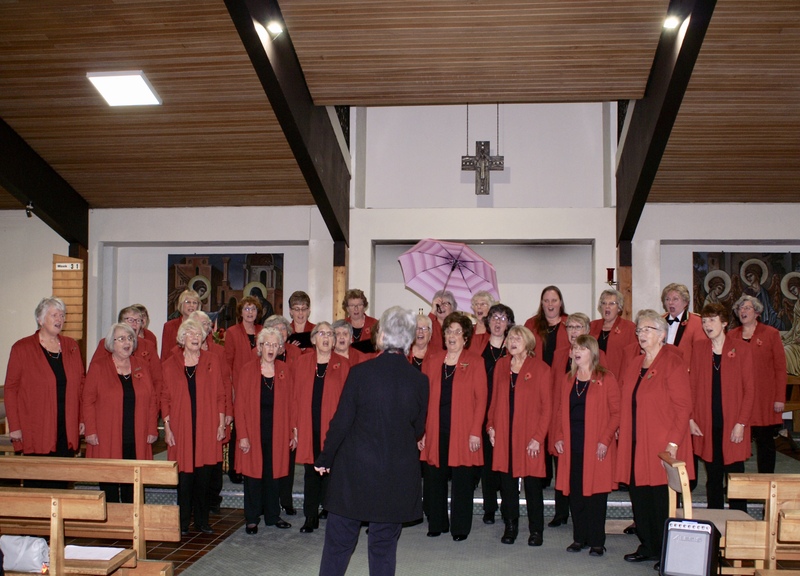 Stithians Ladies Choir will be supporting the work of the MS Society when they present their next concert. 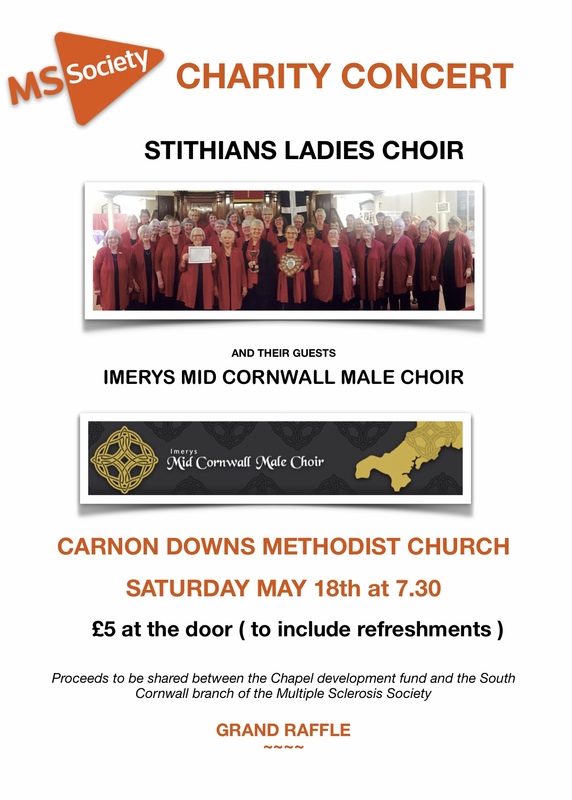 Come along to Carnon Downs Methodist Chapel on Saturday 18th May and hear some fine singing from our guests, Imerys Mid Cornwall Male Choir, and of course ourselves. FIFTY SHADES OF PURPLE – well, more like 100! March 8th is International Women’s Day and this year, for the first time, the Ladies hosted a musical celebration to mark the event. They were joined by Mevagissey Ladies Choir who were invited following our visit to them last year in the beautiful St Goran church. They were also joined by the wonderful ladies barbershop chorus Celtic Chords – their current MD, Isabel Austin, sings with our choir. The Kenwyn Quartet also came along to play in the finale. The soloists were soprano Simone Hellier and ‘cellist Becky McGlade, both talented and engaging musicians and all the performers received a warm response from the capacity audience. The purpose of the concert was to celebrate the lives of inspiring Cornish women and during the evening narrators Sue Whitmore and Oriel Bennett kept us enlightened and entertained with facts and stories about Mary Kelynak, Emily Hobhouse, Rowena Cade, Suzanna Hext, Esme Page and Anne Glanville. These are all remarkable women, setting us all an example through their achievements, determination and sheer ability to get things done. 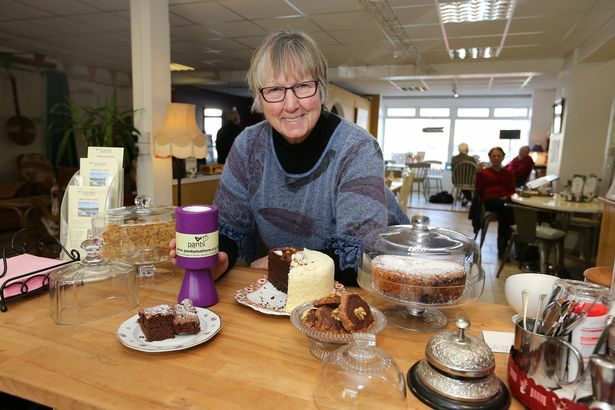 Jeannette Preston spoke about the charity Pants Cancers and a very useful amount was raised in the collection. 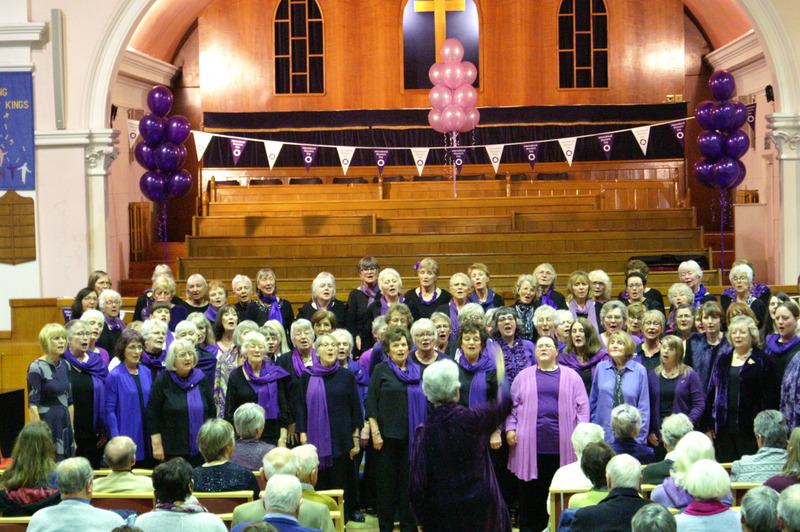 The colour adopted by International Women’s Day, and worn throughout the world, is purple and Falmouth Methodist Church was beautifully decorated, awash with varying hues worn by performers and audience. This added to the lovely celebratory mood of the evening which was warm, relaxed and buzzing with bonhomie. Sharing a common purpose always brings a genuine feeling of togetherness and, following a grand finale where almost a hundred performers joined to sing “ Let There Be Peace On Earth,” we spilled out to partake of a huge feast and enjoy each other’s company. 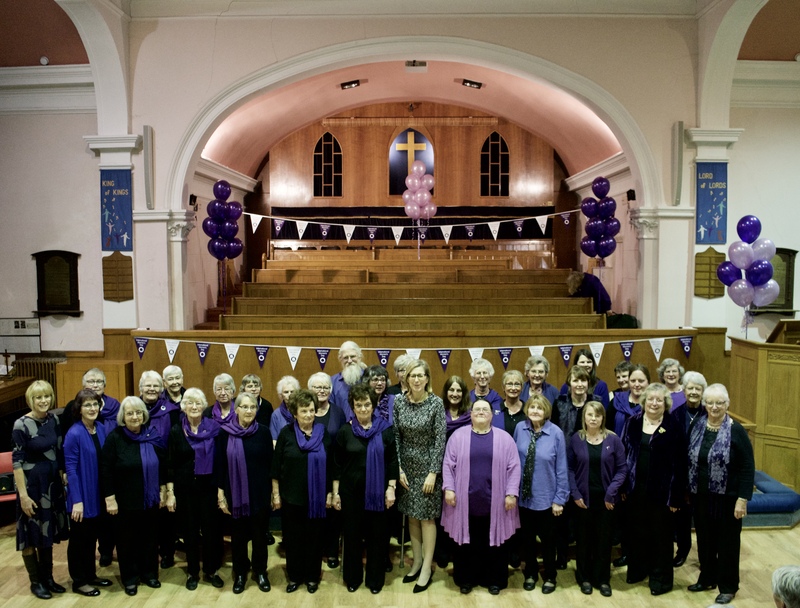 This was a memorable event and the Ladies pulled out all the stops, enlisting their menfolk to help, cheerfully undertaking the host of jobs involved, looking resplendent in their purple, singing like angels and proving once again that Stithians Ladies Choir is a force to be reckoned with. We welcome Oriel Bennett and Sue Whitmore as the narrators for our special event for International Women’s Day. In between musical items they will be telling us about the lives for inspirational Cornish women, past and present. Oriel, ( right ) a dance and fitness instructor, has been an actor, director and producer in many theatrical productions and is known throughout the County for her dynamic approach to dance, drama, music and comedy. 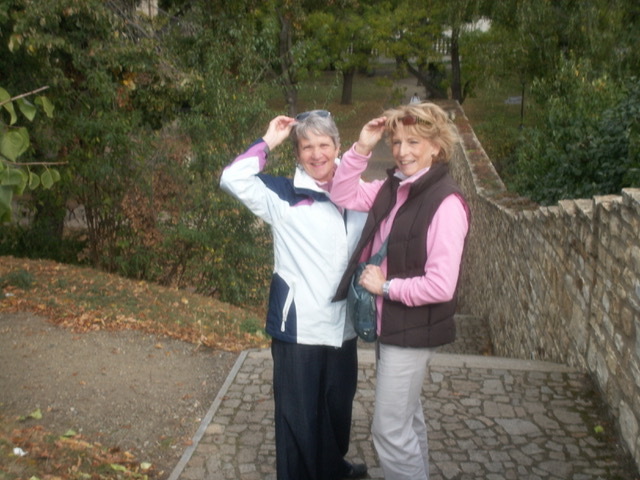 Sue, ( left ) a musician who loves singing and choral music has also featured in many productions, specialising in forthright old ladies who play the piano. They have been friends for many years and enjoy travelling to far-flung places and taking on new challenges. We are grateful that they have accepted the challenge of turning our concert into such a special event! A few people have asked if this is a women only event. The answer is: nearly all the participants are women but please bring a man ( or half the tenors in a male voice choir ) if you want to. They are very welcome to celebrate with us! Simone joins us for the first time to help us celebrate International Women’s Day. 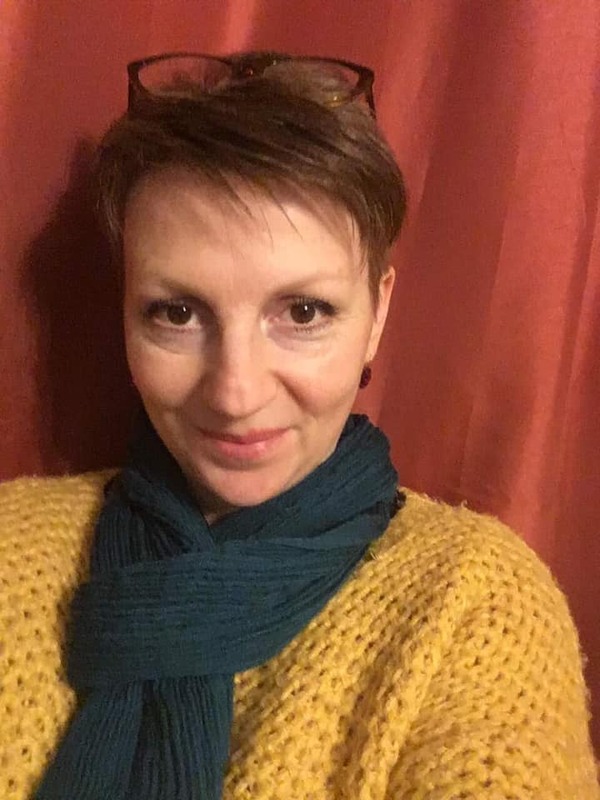 She will be singing a couple of solos, accompanied by the fabulous Rico Gerber, and joining the massed choirs to sing the solo part in Let There Be Peace On Earth for our finale. Simone Hellier trained in classical singing at the Conservatoire in Basel, Switzerland. She has performed in La Traviata at the Hall for Cornwall and in The Marriage of Figaro and Madam Butterfly at the Minack Theatre – sharing the part of Suzuki with Jenny Oldfield, and played Carmen for Duchy Opera, which toured all over Cornwall. She also had the opportunity to tour internationally with the Cornish cirque troupe Incandescence. Simone has collaborated with Jenny Oldfield and Kyla Goodey on a Trifle Gathering project in the Gyllyngdune Gardens at Falmouth Pavilions. She sang alongside baritone Mike Dewis and other wonderful singers, in UNICEF`s Concert for Nepal in London, to raise money for earthquake victims. In August 2017 she gave a classical recital at St Mary`s Church in Penzance and also took part in a show called If you go down to the woods today performed in Trebah Garden with the Vertical Dance Company Yskynna singing the Lakme Flower Duet and the wonderful Aria from the 5th Element Il dolce suono Lucia di Lammermoor. In April 2018 Simone performed Strauss’s Four Last Songs at St Mary`s Church, Penzance under the baton of Nigel Wicken and a lovely video of the performance can be found >>here on YouTube. Simone’s broad reaching repertoire and engaging personality have ensured numerous performance opportunities with many more to come and we are honoured that she is joining us for our celebration. 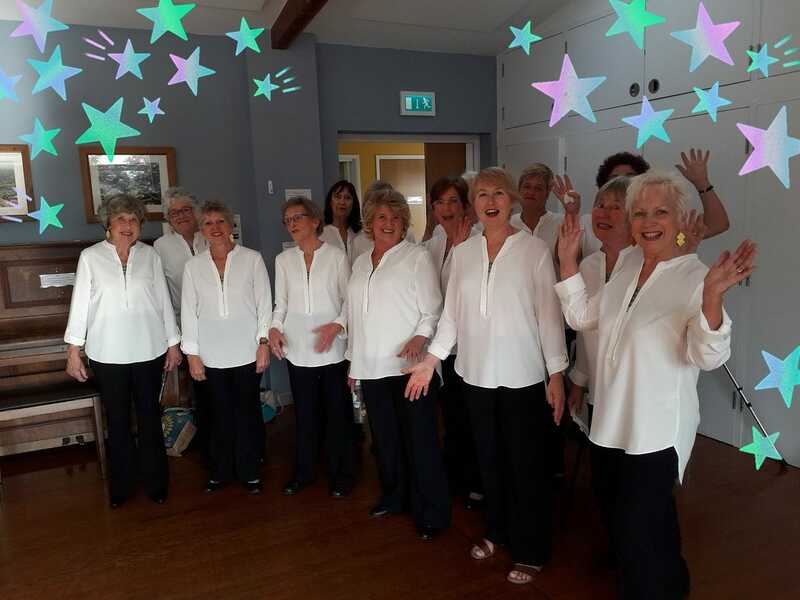 Celtic Chords are a relatively small Ladies Barbershop Chorus who meet to rehearse every Monday evening at Devoran Village Hall. An extremely close knit group, they thoroughly enjoy singing together and also love to share that enjoyment with others. Many of their ‘sing outs’ are at memory cafes for people with Alzheimer’s and it always gives them great pleasure when the audience joins in. 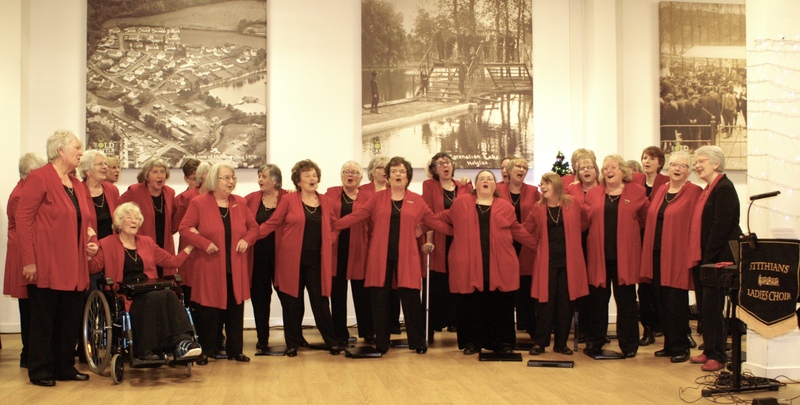 Though not overly ambitious, they have competed several times at the Sweet Adelines Convention in Newcastle and Nottingham, and in 2016 successfully competed in the Llangollen Eisteddfod. They are always looking for new singers – neither experience nor the ability to read music are necessary. 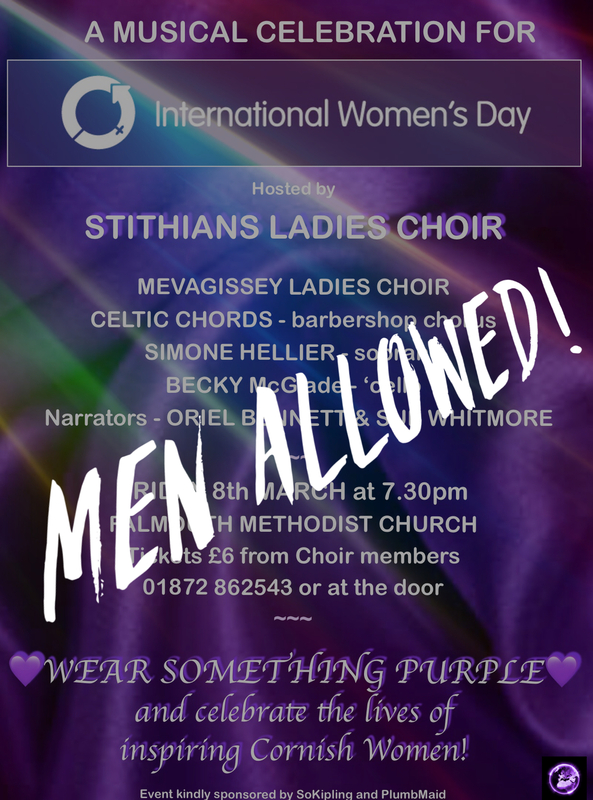 Their current Musical Director, Isabell Austin, is also a member of Stithians Ladies Choir so she is going to be a very busy lady at the International Women’s Day Celebration! Fun in the old cattle market! At the invitation of our friends Pentyr Singers the Ladies sallied forth to Helston Old Cattle Market to sing the first of our Christmas concerts. The weather was decidedly December, our numbers were somewhat depleted but a fine evening of shared music and friendship was had. We performed two new songs for the first time and they were hugely successful! The audience was large, enthusiastic and also in fine voice. There were lovely festive refreshments at the end of the concert and all in all a great time was had at this fine community venue. Most important of all the concert raised a fabulous £664 for Hospice South West! Thank you, Pentyr, for your kind invitation. Our next Christmas events are the community carol service at Stithians Methodist Church on Sunday 16th at 3pm followed by carols in The Stithians Centre on Tuesday 18th with St Stythians Band and St Stythians Male Voice Choir. Well – that’s the title of the song we are performing in this photo. But it certainly did rain on Friday 9th November when we sang at Truro Catholic Church. Together with St Stythians Band we had been invited to perform in a fund raising concert by the Truro branch of the Royal British Legion. The weather that day was just awful but it did clear up just as most of the musicians were arriving. We were able to share some truly beautiful music with Legion members, the Mayor of Truro, those daring souls who braved the elements and each other. The programme was designed to become more reflective as the evening went on and there were some exceptionally moving moments, including poetry, a piece involving The Last Post from the band and Rutter’s The Lord Bless You and Keep You from the Ladies. In a weekend which was packed with commemorative events all over the world this was far from the best attended or the most successful financially. 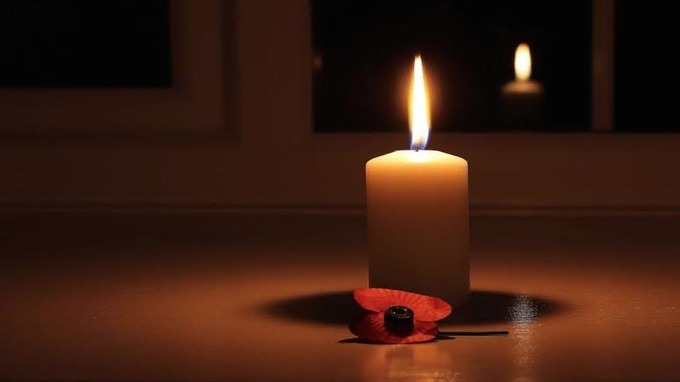 However the act of thoughtfully preparing music and words to share with others in the spirit of Remembrance shows the generosity of spirit and caring which continues to abound in the village of Stithians. 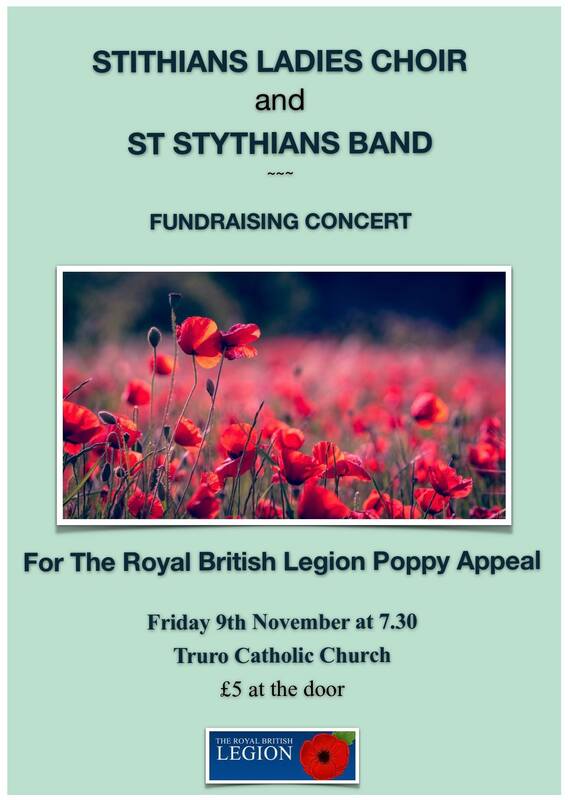 Please join us at our next concert which is in support of the Royal British Legion as they mark their centenary year. A time to remember and reflect. Some time ago we raised a fabulous £1000 at a joint concert with the Celtic Male Ensemble. Last night, at our regular Thursday practice, a representative from the Air Ambulance came to collect our donation. Thank you to all those who made this superb amount possible.